There’s always a fair amount of handwringing about PISA scores, as though the performance of a country’s 15 year-olds on this assessment is indicative of – or hell, the final word on – the strength or weakness of its school system. The interpretation of PISA scores tends to suffer from confirmation bias, simply affirming pre-existing beliefs about education policies and practices. And of course, PISA scores also provide the media with an opportunity to craft scary headlines about an impending doom of dumb. 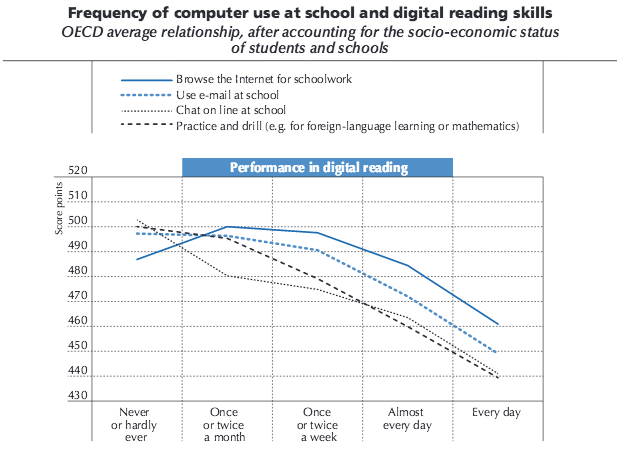 …Even where computers are used in the classroom, their impact on student performance is mixed at best. Students who use computers moderately at school tend to have somewhat better learning outcomes than students who use computers rarely. But students who use computers very frequently at school do a lot worse in most learning outcomes, even after accounting for social background and student demographics. The results also show no appreciable improvements in student achievement in reading, mathematics, or science in the countries that had invested heavily in ICT for education. And perhaps the most disappointing finding of the report is that technology is of little help in bridging the skills divide between advantaged and disadvantaged students. Indeed, technology might actually make things worse, particularly for disadvantaged students, in part because of the type of tech and how it’s used in their classrooms. The OECD report found, for example, that “drilling” software has a negative effect on performance (that is, to be clear again, performance on the PISA). And yet this type of software, and more broadly computer-based math instruction, is much more commonly used for disadvantaged students. And education technology in and of itself is surely not progressive.